In addition to checking company settings, you should review your client’s Chart of Accounts to make sure it looks the way you want. In the client QuickBooks Online company, click the Accountant Tools button and choose Chart of Accounts to display the Chart of Accounts page. You also can open the Chart of Accounts from the Navigation bar (under Transactions) and from Gear menu on the QBOA toolbar. All roads lead to Rome. If you chose to enable the option to use account numbers while you were reviewing company settings, the Chart of Accounts page displays a column for account numbers at the left edge of the Chart of Accounts page and the Batch Edit button in the upper right corner. You might need to edit an account to change an account’s Category Type or its name, and you use the Account window to make the change. If you decide to add account numbers to the Chart of Accounts, you can add an account number in the Account window, but there’s a much easier way, which you discover below. To display the Account window, click the down arrow in the Action column at the right side of the account and, from the menu that appears, click Edit. Or, if you need to create a new account, click the New button above the list. The window you see when creating a new account looks just like the one you see when you edit an existing account. If you double-click an Asset, Liability, or Equity account, QBO displays the account’s register (except Retained Earnings, which displays a report). 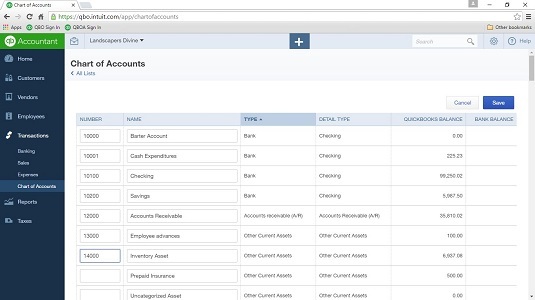 If you double-click an Income or Expense account, QBO displays a QuickReport for the account. You also can click the Register and Report links in the Action column to display a register or a report. There is an easy way to add account numbers to a QBO company Chart of Accounts. First, make sure you enable the setting on the Advanced tab of the Settings dialog box (in the Chart of Accounts section). Then, on the Chart of Accounts page, click the Batch Edit button (the one that looks like a pencil on the right side of the table above the table headings) to display this page. Type account numbers in the Number column. Save buttons appear at the top- and bottom-right corners of the page; click either button after you finish entering the account numbers. Because a QBOA session times out by default after 60 minutes of non-use, you might want to save periodically as you enter account numbers. After you enter account numbers, you can sort the Chart of Accounts in account number order by clicking Number in the column headings on the Chart of Accounts page.